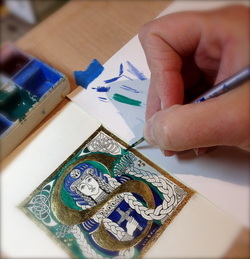 ThistleWork Design offers a range of artistic services including calligraphy, hand lettering, gilding and decorative painting. Framingham, Massachusetts artist, Diane McDougall-Desautelle works closely with clients to provide custom designs that match their personality and vision. You may click on the "Gallery" link to view examples. You may also find ThistleWork creations for sale on Etsy.